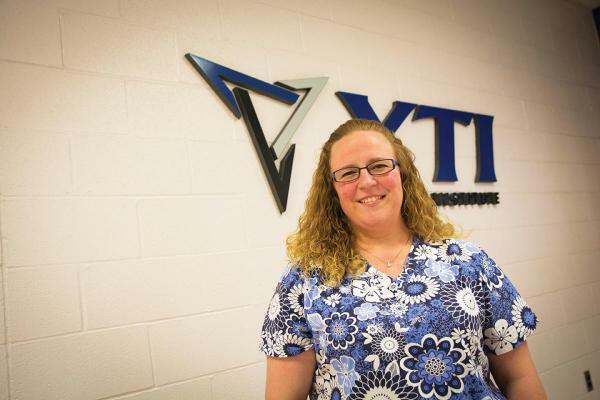 Injuries from a serious car accident in 2008 forced Kari Herchelroth ’03 to re-evaluate her career path, propelling her from her job as a certified veterinary technician to director of the new veterinary technology program at the YTI Career Institute in York, Pa. Her exemplary performance in helping to create and then directing YTI’s program earned Herchelroth the 2017 Certified Veterinary Technician of the Year Award from the Pennsylvania Veterinary Medical Association. She was honored at the Keystone Veterinary Conference, held last year in Hershey. Megan Baylor, a former YTI faculty member and current adjunct instructor, nominated Herchelroth for the award because “Kari has been very focused on improving the veterinary technician profession through educating the next generation.” Herchelroth is committed to her staff and students and willing to go above and beyond to ensure a student’s success, Baylor said. Before her 2008 car accident, Herchelroth worked as a certified vet tech at Donegal Animal Hospital in Mount Joy, Pa. After her accident, she had to learn how to walk again. She returned to her job at Donegal but had trouble performing some of the physical parts of the job. “I decided to start looking to see if there was a way I could continue to be a vet tech, but not have to get up and down off the floor all day. It was really hard on my body and I was having trouble doing it,” Herchelroth said. Herchelroth’s practice manager encouraged her to attend an open forum about a new vet tech program YTI was proposing. “I shared my opinions and they called me a few months later and asked if I wanted to consult on the program,” Herchelroth said. She advised YTI on the program’s curriculum, books, equipment and facility. When the program director position opened up, she applied and was hired for the job in November 2012. The first YTI vet tech class graduated in February 2013 with 24 students. The program now has 140 students, two full-time veterinarians, seven full-time faculty members and several part-time instructors. Students range from recent high school graduates to senior citizens. Herchelroth is responsible for leading the program, directing the faculty, advising the students and maintaining the program’s accreditation. She also teaches classes in anesthesia, hematology and other subjects as needed. “I love being able to share my knowledge and experience with the students,” Herchelroth said. The Alumnae Association of Wilson College will recognize Herchelroth with its Outstanding Young Alumna Award in part for her success with YTI during Reunion Weekend in June. The YTI program moves quickly and is designed for students who want to get into the vet tech field as soon as possible, according to Herchelroth. Graduates of the 21-month program receive an associate degree in specialized technology. To become certified as vet techs, they must pass a national exam and apply for licensure through the state they will work in—the same procedure as a Wilson graduate with a bachelor’s degree. She advises students to attend Wilson when it’s a better option for them. “For example, when I have students who are considering going to veterinary school, I direct them to Wilson because it's better for them to have a bachelor's degree,” Herchelroth said. Herchelroth, who grew up in Bainbridge, Pa., began her college education as a biology major at Millersville State University. She considered becoming a biology teacher but then landed a part-time job as a veterinary assistant at Donegal Animal Hospital. That experience led her to change her college plans. Herchelroth transferred to the veterinary medical technology program at Wilson College as a second-semester sophomore, choosing the College because some of the vet techs she worked with at Donegal were Wilson graduates. “They were big advocates of Wilson College. Even the doctors there were,” she explained. Wilson turned out to be the perfect choice. “I wanted a smaller school, and Wilson was the perfect size for me. It was just a great fit,” she said.